This article discusses websites containing JR discussion groups, online scenarios, and other links. Of particular interest is the Johnny Reb III Yahoo Group. I encourage those of you thinking of getting into miniatures gaming to check this message board out. This is the second Johnny Reb Gaming Society trivia contests. One winner received a prize package from one of the Society’s sponsors. Included on the page are the answers to the first trivia contest. Burkhard Schulze reviews 25mm flags produced by GMB Designs in this article. Apparently at the time of this article’s writing, GMB had flags available for 56 different Union units and 46 different Confederate units. This is a scenario modeling the early part of Buford’s delaying action at Gettysburg versus Heth’s Division. It is GHQ’s Tac News Scenario #3 and it was not specifically designed for any gaming system. The game uses 4-inch wide hexes, and the map is 7×12 hexes. Scott Mingus goes over the differences in how corn was planted during the Civil War and how it is planted today. Basically, corn was planted in crisscrossed patterns of “mounds” during that time versus the straight rows we see today. Corn was also shorter during this era before advanced agricultural practices were used with any regularity. Terrain guru Doug Kline of Battlefield Terrain Concepts follows up Scott’s article with his own discussing how to wargame the effects of cornfields. He mentions Johnny Reb specifically, and then he also shows how to model corn on the tabletop. This article discusses the countercharges of elements of the Union I Corps and XI Corps during the first day at Gettysburg. This is a scenario designed specifically for Johnny Reb II. This is a pretty large scenario which requires a lot of figures and terrain. The color map shows a game board of 4×6 feet is required. This looks like a really interesting scenario, though a lot of gamers would probably need to combine collections to play it. 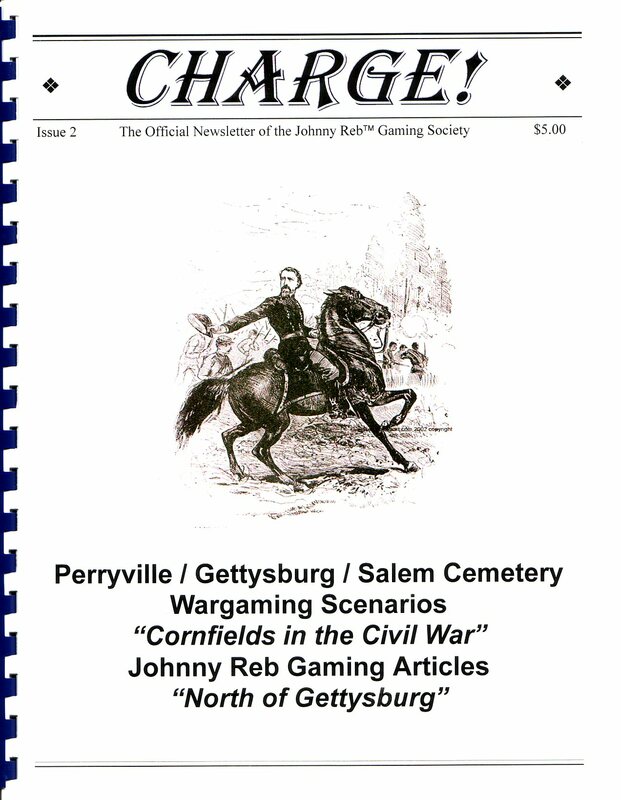 In this section, Johnny Reb creator John Hill responds to gamer questions to clarify rules. In this section, the editors review products associated with miniatures gaming. In this particular issue, Jeff Chierpeski’s Black Mountain Miniatures painting service is reviewed. Apparently Jeff did not have a web site at the time of the review, and I don’t print anyone’s email address on this blog. I did a Google search and found the site here. This small article discusses an alternate way of handling charges and includes a nice chart to illustrate the alternate rule. This small scenario features an ambush set by the force defending Jackson, TN against Forrest’s Cavalry Brigade. Table size is 3×4 feet and this is a Brigade versus Brigade level scenario. The article includes an excellent color map.